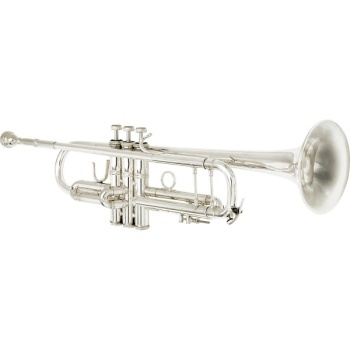 he Bach Stradivarius 180S37 Silver Professional Bb Trumpet offers the depth and color of sound, coupled with the even intonation and response a professional player needs. Good for all-around playing, this Bach 180 Strad Pro Trumpet features a standard weight body and #37 bell, plus a standard construction #25 mouthpipe in silver finish. The most popular Bach Stradivarius trumpet available today the 180S37 is also available with a 1st valve trigger (180S37T) or 1st and 3rd valve triggers (180S37W55), or with a gold brass bell (180S37G). The Bach 180S37 Stradivarius Series Silver Professional Bb Trumpet includes a case and mouthpiece and is available in silver finish. The 180S-37 features a #37 bell with a medium-fast taper to produce a sound that has a brilliant sound with a warm quality that allows this instrument to work well in multiple musical settings from jazz to concert or solo playing. The #25 leadpipe allows for slight resistance that is effective in centering tone production. These features combined with a .459-inch medium-large bore allow the player to produce a well-rounded sound while not over-extending the endurance level of the player. The Monel valve material allows the pistons to be machined to a consistent diameter throughout the entire length of the valve to produce a more efficient "seal" between the piston and the interior wall of the valve casing. The result is less air leakage that could cause performance problems.